You know we moved from Australia, where we were conceived and born, to Switzerland, where Mum is from. Mum finally starts to ‘like’ her new home. I like it here: I’ve got my adorable cousin and godmother Ayana here, my aunty Michele, my godfather Pascal and Nonno who lives with us (when he’s home…). We also have lots of Mum and Dad’s friends visiting and really nice neighbors. I hope that where you are, HoPe, it’s warm and cosy all the time. We love you ♥ and miss you – especially now I could use your support here. I’ve tried this tricycle and Mum said I was still too small (my feet didn’t reach the pedals). I’m sure if we were both talking to her, we could convince her. Maybe you could have a word with her in her dreams? This entry was posted in family, missing my sister, mum and dad and tagged bicycle, driving, family, first steps, riding bike, riding tricycle, tricycle, walking. Bookmark the permalink. 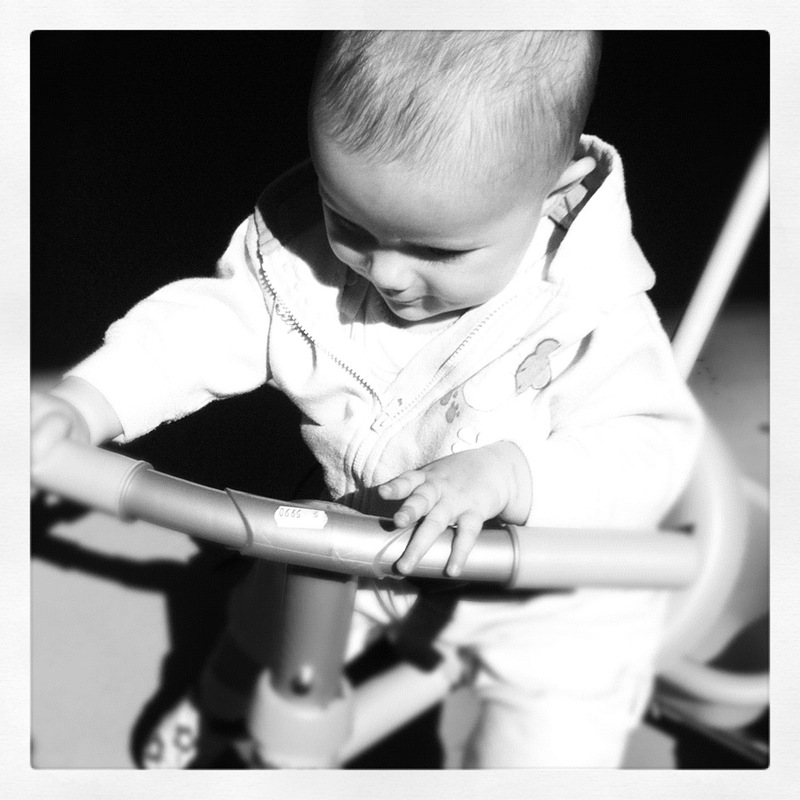 Love this picture… She is growing SO fast! What a beauty. Love the blog. Ananda Mae, Hope already talked to me about the tricycle, or at least something very similar… just wait til X-mas…. And, what I wanted to ask you: when you’re in your bed, awake for hours, not crying… is this the time, when you are having conversations with Hope? Love you, little cutiepie pumpkin!